Oil prices fell on Wednesday from 2.5-year highs in anticipation of the U.S. crude inventory data reports. The American Petroleum Institute (API) reported a draw of 6.0 million barrels of United States crude oil inventories for the week ending December 22, marking four large draws in as many weeks. Analysts had expected a smaller drawdown of 3.97 million barrels of the fuel. Supply risk has increased in 2017 as a side-effect of the OPEC output cut deal, and disruptions now have a much stronger effect on oil prices in a quickly tightening market. Outages in Libya and the North Sea have pushed prices upward in recent days, with WTIbriefly surpassing the $60 milestone. On the flipside, the Permian Basin, U.S.’ most prolific shale patch, has beaten its own production record, pumping an estimated 815 million barrels of crude this year. U.S. shale producers expect to further boost output in 2018, soaring above 10.5 million bpd. In the short term, however, increased production hasn’t led to a surge in U.S. crude inventories. In fact, analysts polled by S&P Global Platts predicted a drop in crude inventories for the fourth consecutive week, and were confirmed by this week’s API report. Last week, the American Petroleum Institute (API) reported a large draw of 5.222 million barrels of crude oil, along with an increase in gasoline inventories of 2.001 million barrels. This week, the API is reporting another strong build in gasoline inventories at 3.1 million barrels for the week ending December 22. The results came in close to forecasts for a 1.278-million-barrel build. Distillate inventories saw a surprise build this week of 2.8 million barrels, against a forecast of a 584,000-barrel draw. Inventories at the Cushing, Oklahoma, site decreased by 1.3 million barrels this week. The dip in US crude oil inventories comes after weeks and weeks of increasing oil production in the United States, growing from an average of 8.946 million bpd in the first week of January of this year and reaching an average of 9.789 million bpd for week ending December 15. The U.S. Energy Information Administration report on oil inventories is due to be released on Thursday at 11:00 a.m. EDT due to the Christmas holiday. By 4:43pm EST, the WTI benchmark was trading down 0.63% on the day to $59.59 while Brent was trading down 0.96% on the day at $65.82. Driven by higher gasoline prices, Canada’s annual inflation rate jumped to 2.1 percent in November, after a 1.4-percent yearly increase in October, Statistics Canada said on Thursday, announcing figures that beat both analyst expectations and Bank of Canada’s ideal target of 2-percent inflation for possible interest rate hikes. The annual inflation rate last month was the highest since January 2017, Statistics Canada said. Excluding the gasoline price index, Canada’s consumer prices increased by 1.5 percent year over year in November after having risen 1.3 percent in October. Prices rose in seven of the eight major consumer price index (CPI) components, and the transportation and shelter indexes contributed the most to the price increases. Gasoline prices jumped 19.6 percent year over year in November, following an increase of 6.5 percent on the year in October. “The increase was partly attributable to higher crude oil prices in November, as well as a monthly decline one year earlier,” Statistics Canada said. Among the Canadian provinces, gasoline prices increased the most in Alberta—by 30 percent on the year in November. The higher gasoline prices contributed the most to the transportation prices increase of 5.9 percent annually in November, after a 3.0 percent rise in October. “The case for the Bank of Canada to follow the Federal Reserve in hiking interest rates is building,” James Marple, an economist at Toronto-Dominion Bank, told CBC. “Don’t be surprised if it comes sooner rather than later,” Marple said. The American Petroleum Institute (API) reported a draw of 5.222 million barrels of United States crude oil inventories for the week ending December 15, marking three large draws in as many weeks. Analysts had expected a smaller drawdown of 3.518 million barrels of the fuel. Last week, the American Petroleum Institute (API) reported a large draw of 7.385 million barrels of crude oil, but had dampened enthusiasm that the oil bulls may have had by countering that with a build of 2.334 million barrels of gasoline. This week, the API is reporting yet another build in gasoline inventories at 2.001 million barrels for the week ending December 15. The results came in close to forecasts for a 2.231-million-barrel build. WTI and Brent were trading up earlier in the day as an Ineos press release foretold of weeks of delays on its Forties pipeline as custom parts are built, causing the pipeline to be shut down until then after a crack had been discovered. That pipeline outage, according to Bloomberg, is expected to take between 5.5 million and 13 million barrels of oil out of the market before the repairs are complete. By Tuesday 10:32am EST, WTI was trading up .40% at $57.47 per barrel, while Brent crude was trading up .54% at $63.25. Distillate inventories saw a draw this week, down 2.85 million barrels, against a forecast of a 1.327-million-barrel draw. Inventories at the Cushing, Oklahoma, site increased by a modest 70,000 barrels this week. The dip in US crude oil inventories comes after weeks and weeks of increasing oil production in the United States, growing from an average of 8.946 million bpd in the first week of January of this year and reaching an average of 9.780 million bpd for week ending December 8. By 4:36pm EST, the WTI benchmark was trading up 0.63% on the day to $57.58, while Brent was trading up 0.72% on the day at $63.36. Chevron Corporation plans to cut its total capital and exploratory budget for a fourth consecutive year in 2018—to $18.3 billion, compared to the $19.8 billion that it planned for this year, but the supermajor is significantly boosting spending on U.S. shale, especially in the Permian. Chevron’s capital expenditure for 2017 envisaged a $2.5 billion allotment for shale and tight oil and gas, most of which was to be invested in the Permian Basin in Texas and New Mexico. For 2018, Chevron’s investment in U.S. shale includes $3.3 billion—just for the Permian—and another $1.0 billion for other shale and tight rock investments, for a total of $4.3 billion. “We’re fully funding our advantaged Permian Basin position and dedicating approximately three-quarters of our spend to projects that are expected to realize cash flow within two years,” Chairman and CEO John Watson said in Chevron’s press release. “With production currently exceeding guidance in the Permian, our 2018 plan should deliver both strong production growth and solid free cash flow, at prices comparable to what we’ve seen this year,” Watson said. Chevron’s total U.S. upstream capital and exploratory expenditures are planned at $6.6 billion, and international upstream investment is seen at $9.2 billion. Chevron will also spend $2.2 billion on its downstream business, of which $1.4 billion earmarked for the U.S. downstream. Chevron plans around $5.5 billion of its upstream program to go to major capital projects underway, including $3.7 billion for the Future Growth Project at the Tengiz field in Kazakhstan. The U.S. supermajor expects its global exploration funding next year to be about $1.1 billion. The rest of the upstream spend will go to early stage projects supporting potential future developments. “Our 2018 budget is down for the fourth consecutive year, reflecting project completions, improved efficiencies, and investment high-grading,” Watson said, summing up Chevron’s capex plans for next year. As Saudi Arabia spins from crisis to crisis, U.S. oil hasn’t missed a beat. It’s stronger and more resilient than ever–and it has nothing to do with OPEC oil production cuts. In this war, U.S. oil wins, and the recent purge of billionaire princes in Saudi Arabia is icing on the cake. But when Saudi Crown Prince Mohammad bin Salman arrested key members of the royal family on corruption charges two weeks ago all of them his rivals–oil shot up. West Texas Intermediate (WTI) spiked more than $2 a barrel, closing around $57 a barrel—a nearly two-year high. OPEC cuts have done little to boost oil prices, and Royal Family arrests are welcome news for oil tycoons the world over, but it’s still not what’s kept the U.S. on the winning side in this war: Fracking bust the U.S. through the front line, and major advancements in enhanced oil recovery (EOR) are cementing the victory. This is a sophisticated technology story, and one little-known company might just tell it best because it’s sitting on the first-ever technology which has the ability to produce oil from massively untapped U.S. oil sands plays, with price targets for production at around $22 a barrel. The company is Petroteq Energy Inc. (TSX:PQE.V; OTCQX:PQEFF), and it’s all about American oil for America. But it’s not just about market-defying prices … It’s about a tech breakthrough that renders dirty oil sands production process clean—for the first time. 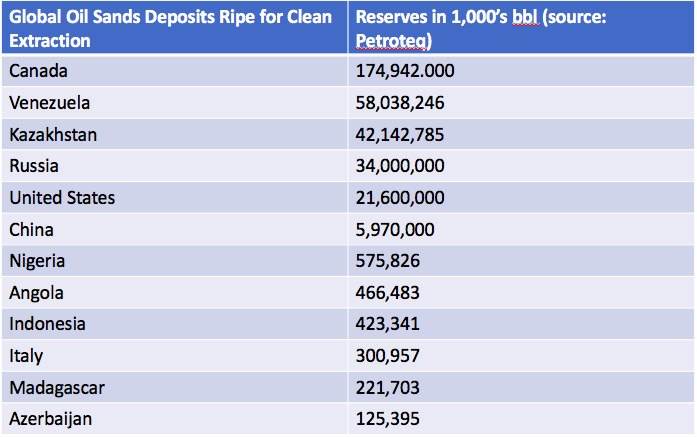 And Petroteq isn’t aiming just to be producing cheaper oil—it intends to license its advanced technology globally, targeting not only the 1 trillion-plus barrels of oil in sands in Utah, Colorado and Wyoming, but the tens of trillions everywhere around the world. The State of Utah is home to more than half of all U.S. oil sands deposits, and the Unitah region has been producing oil since the 1950s. It’s got more than 32 billion barrels of oil sands waiting to be extracted from 8 major deposits. It’s also got fantastic infrastructure, with 5 major refiners with truck routes to Salt Lake City, and a royalties set-up that makes great sense for operators. And it’s right here—in Asphalt Ridge—that Petroteq has 87 million barrels of oil equivalent. Even better, this is heavy oil-producing oil sands that can be accessed directly from the surface, so there’s no risk of running into a ‘dry well’. Better still, costs to produce expected to come in at only $22 a barrel. With one plant, Petroteq says it’s potential is $10 million a year in profit with $20-$30 per barrel production costs at today’s oil prices. They acquired Asphalt Ridge for $10 million, and they’ve already proved that they can extract the oil from the sands and the shale. Permits to produce are already in place, and 10,000 barrels were produced in 2015. Now the modular plant has been moved even closer to oil resources and is being reassembled. New production is scheduled to launch in early 2018, and the goal is 5,000 bpd in 2019 at a cost of production of as low as $18 per barrel. And there’s potential, says Petroteq, to achieve 30,000 bopd with proven reserves. So, while oil sands in Canada are prohibitively expensive to produce in today’s oil-price environment, Petroteq has found a way to produce in Utah for a targeted $22 per barrel. Winning the oil war against OPEC, and helping the U.S. to become energy independent is all about technology. And U.S. national interest right now is all about increasing domestic energy sources. This means that technological advances such as Petroteq’s (TSX:PQE.V; OTCQX:PQEFF) proprietary Liquid Extraction System will become a key focus for developing U.S. oil sands deposits—and not just in Utah. Petroteq’s already has a significant claim to fame: Its patented oil extraction technology is the first ever to generate sales from Utah’s massive heavy oil resource. Existing oil sands extraction technologies use tons of water and leave toxic trailing ponds. Petroteq’s system produces oil and leaves behind nothing but clean, dry sand that can be resold as fracking sand or construction sand or simply returned to Mother Nature. In tests to date, it extracts over 99% of all hydrocarbons in the sand, generates zero greenhouse gases and doesn’t require high temperatures or pressures. For Utah’s 32 billion barrels this tech is the Holy Grail. The only other place that has oil sands tech is Canada, and it doesn’t compete. It’s designed for wet oil sands and Petroteq is after the dry oil sands bonanza. Technology like Petroteq’s can help make American oil for Americans at a time when energy dependence is as important to the national interest as security and diplomacy. Utah, Colorado and Wyoming represent over 1.2 trillion barrels of oil equivalent in oils sands and shale, and Petroteq is uniquely positioned to use its proprietary tech to tap into this resource and contribute to the U.S. energy independence equation in a significant way. Oil sands has long been sidelined because it’s dirty. So, proprietary technology that can extract oil sands without leaving behind toxic trailing ponds is highly sought after. This is far from a simple story about another small-cap oil producer. Petroteq’s technology could generate millions in licensing fees around the world, and it is eyeing the opportunity to file patents in all countries with oil sands reserves. This technology is aimed to be deployed to cleanly unlock oil resources representing hundreds of millions of barrels of oil around the world. LIcensing is a revenue stream that can flow to Petroteq (TSX:PQE.V; OTCQX:PQEFF) with no associated capital expenditure. Worldwide, the licensing opportunities are vast, with over 12 countries home to major oil sands deposits. Fortunes can be built on licensing fees, and Petroteq could have this segment cornered. There’s even more upside beyond global licensing: Petroteq’s technology can be used for remediation, cleaning the tailing ponds created by traditional extraction methods for oil sands. And the third area of upside is the most surprising because it brings Petroteq into one of the hottest sectors in centuries: blockchain technology, the backbone of cryptocurrency. Even supermajors BP, Shell and Statoil are getting into blockchain because it’s what computers were three decades ago and it could make oil and gas trading a lot easier. Their goal? To create a secure, real-time blockchain-based digital platform for physical energy transactions from start to finish. No more paper contracts, automatic authentication and verification, and – the death of the middle man. It promises to reduce costs for the industry, vastly improve the quality of data and bolster security—all the while, speeding things up exponentially. Every single industry the world over will likely switch to blockchain because it’s efficient; it’s transparent; and it creates savings. Petroteq is in the process of signing an agreement with First Bitcoin Capital, which specializes in crypto currency and blockchain development. The visionary small-cap will be licensing the blockchain built by IBM and will use this to make it industry-specific, giving the entire spectrum of oil—from upstream to downstream—access to massive data. Once the product is finished in about six months, the intention is that there will be a free open source blockchain for massive oil data, including everything from how much oil someone bought to how much they paid and how long it took to deliver, where it was drilled, how it was refined—absolutely everything. This is where the Internet of Things (IoT) becomes the Energy of Things. The trading houses will hate it, but no one owns blockchain, and Petroteq sees the opportunity to make massive data work for the entire industry. Petroteq’s masterminds have already been busy courting major energy players on multiple continents to get involved. Bitcoin might be worth over $7,000 per coin, but the real cryptocurrency is data—and this could be a gold mine for the energy industry. This management team is savvy and forward-thinking. That’s why it sees the opportunity not only in producing the first clean oil sands, but also in licensing its proprietary tech worldwide, and embracing the even bigger picture—blockchain. Petroteq (TSX:PQE.V; OTCQX:PQEFF) is hoping to position itself as a sort of “Google” of the energy industry, with its no-holds-barred focus on technology. They aren’t looking 10 years into the future, they are looking into right now. This is where some of the brightest minds in extraction tech, chemistry, and blockchain come together to form a dream team with extraordinary vision. The Chairman and CEO of Petroteq, Aleksandr Blyumkin, has championed this Company and technology with millions of dollars, including an interest-free loan to expand the production capability at its Temple Mountain facility in Utah. Founder and CTO Dr. Vladimir Podlipskiy is a 23-year veteran in chemistry, R&D and manufacturing, and a chemical scientist from UCLA. He’s the oil extraction tech genius with a line-up of patents for everything from oil extraction and mold remediation to fuel reformulators. President Dr. R. Gerald Bailey is a former Exxon president of Arabian Gulf operations, Dr. R Gerald Bailey. He believes in the technology and the company’s ability to not only turn a profit, but protect the environment while doing so. He’s got more than 50 years of international experience at all spots along the oil and gas chain behind him, including as operations manager of Qatar General Petroleum Corp., Exxon Lago Oil in Aruba and Esso Standard Libya. Chief Geologist Donald Clark, PhD, a widely published geologist and consultant, is the blockchain tech genius in this group, responsible for providing input to financial models, analyzing commodity price fluctuations and handling operational and transportation costs of oil and natural gas. And the team supporting them will be working towards licensing-Petroteq’s technology in as many countries as they can. By February 2018, when production is expected to resume from the relocation of their modular facility, Petroteq may be in the spotlight for many investors. And in the meantime, heavy oil demand looks promising, oil prices are for the first time in years on a trending upswing and blockchain, well, that’s simply changing the way business is done. Now could be a good time to get back into oil because they’re calling the bottom and the market is in an upswing. And prices could be kept higher by military action in the Middle East, the Kurdish independence drive and the specter of more U.S. sanctions on Iran, says Barrons. And Goldman Sachs says near-term sentiment should remain bullish. It’s a good time for heavy oil, too. Billions of dollars will be deployed to rebuild U.S. infrastructure and it requires exactly the kind of heavy oil that Petroteq (TSX:PQE.V; OTCQX:PQEFF) is scheduled to start producing again in February, 2018. 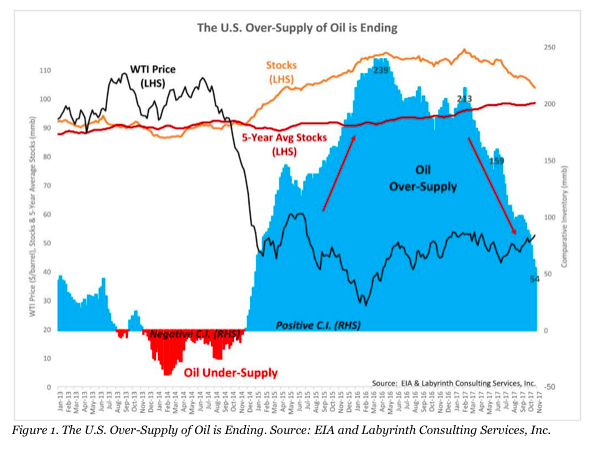 The U.S. over-supply of oil is ending, according to Forbes. U.S. production growth has focused on light oil, and heavy oil is in strong demand, particularly on the Gulf Coast, where the billions of dollars put into heavy oil refineries means it needs a lot of oil to feed them. Heavy oil traditionally trades at a discount, but as demand rises, the discount is disappearing. This is a story of extracting $22 oil… in a $55-barrel world. Or, maybe even a $70-barrelworld by next year. This company breaks down everything and makes a much bigger picture out of the smaller pieces. • Its technology breaks down oil sand extraction in a clean, low-cost, efficient closed-loop process. • The clean sand has an upside of potential re-sale for fracking or construction. • The proprietary tech itself can be used for cleaning up other oil sands messes around the world. • And it will be licensed globally for major revenue potential from the Americas to Africa, and everywhere in between. • It could all come together with the energy blockchain, harnessing the power of massive, transparent data for every stop in the oil and gas chain. While Saudi billionaires are languishing in prison, Petroteq’s (TSX:PQE.V; OTCQX:PQEFF) innovative dream team is taking the re-emerging oil bull market by the horns, and riding the biggest digital wave of our time—blockchain. This is where energy and technology come together definitively, and one they piece it all together, it could be a very large force in a small-cap world. Parsley Energy Inc (NYSE:PE) is a major player in the Permian shale play. The company’s assets are primarily located in the Midland and Delaware basins. Specializing in acquisition, development and exploration of unconventional oil and natural gas reserves, Parsley Energy trades around a modest $30/share and has an impressive $9.35B market cap. The company’s management is second to none which will give investors confidence in moving forward. Kosmos Energy Ltd. (NYSE:KOS) is a company which focuses on oil and gas exploration, development, and production in emerging areas offshore West Africa. With assets in Ghana, Mauritania, and Senegal, the company already has a strong portfolio. But the real draw for investors is the licenses it carries for potential exploration in Sao Tome and Principe, Suriname, Morocco, and Western Sahara. Moving forward, this is definitely a company to keep an eye on. Seadrill Ltd (NYSE:SDRL) is a company that offers services relating to everything offshore. As an offshore drilling contractor, Seadrill is a go-to for companies rushing to complete their deepwater projects. As offshore regains its popularity and new finds are ready to be developed, Seadrill has a wealth of resources to complete, maintain, and nurture these projects. With operations in the Middle East, Southeast Asia, Northern Europe, the United States, and South America, this oilfield services company is one to watch. Diamond Offshore Drilling Inc (NYSE:DO) is a Houston-based oilfields services company with contracts in Gulf of Mexico, South America, Australia, Southeast Asia, Africa, the Middle East, and Europe, the company is well represented across the world. Its fleet includes 24 offshore drilling rigs, 19 semisubmersible rigs, and one jack-up rig. With a large footprint in the industry and a number of assets, Diamond Offshore is a reputable and secure pick for investors, especially as offshore projects regain popularity. Pioneer Natural Resources (NYSE:PXD) is another oil and gas exploration and production company whose main operations are primarily located in the Permian Basin, Eagle Ford, West Panhandle, and the Raton field. The company also owns interest in eight gas processing plants and nine treatment facilities. With a huge amount of prime real estate in South and West Texas, Pioneer has consistently shown that it is investing wisely which will surely pay off for shareholders. Higher oil prices are letting North American oil and gas companies dodge bankruptcy announcements, according to an analysis conducted by the Dallas-based law firm Haynes and Boone. This year, only 20 companies on the continent have declared bankruptcy—there were three times more than that last year. So far, the oil price crash of 2014 has caused 134 oil exploration and production companies to go under so far, but prices have risen above $60 a barrel this year, buying some underperforming companies times to shape up. Oil field services companies still face the brunt of the price bust, with 43 of them declaring bankruptcy this year. Still, that’s an improvement from 71 bankruptcies last year. Haynes and Boone says 310 oil producers, oil field services companies, and midstream firms have gone under since the top of 2015, just months after the initial crash. North American shale oil and gas companies have proven that they can adapt their business model through the lower crude oil prices cycle. Now, American shale producers might have to adjust their financial strategy when the Federal Reserve (Fed) raises interest rates. U.S. shale oil production has increased multifold to 4.25 million bpd in 2016. The rapid growth in nonconventional production methods (fracking) bloated soon after U.S. interest rates tumbled to record lows—making money very cheap and readily available to be pumped into any projects returning figures higher than the depressed cost of borrowing, even with oil prices trading below $60 per barrel since July 2015. The cost of doing oil business is poised to rise along with the Fed’s inevitable campaign toward ‘rate normalization’ in the world’s largest economy, as it continues to show signs of growth following its rising inflation figures. - Zainab Calcuttawala, Oilprice.com, 2017 November 17. Even if it is not exactly unreal, Tesla’s semi and the Daimler truck can potentially disrupt a market worth tens of billions of dollars globally. There are challenges, notably range and cost, but electric trucks are an emerging niche that should be taken into account in long-term forecasts. UPS, for example, recently said it will be converting a fleet of 1,500 diesel-fueled delivery trucks into all-electric vehicles. It will hardly be the first and last one to consider the conversion.